That garlic is not small, everything else is large this week. 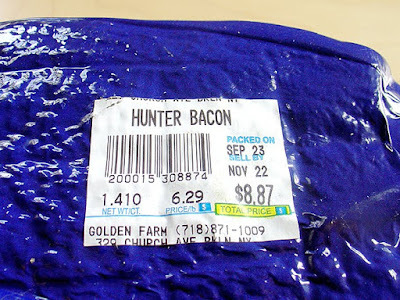 Hunter bacon, the bacon for Hunter College students, by Hunter college students. Nah. My neighborhood of Kensington, Brooklyn, is full of Russian and Eastern European influences. We have 3 polish meat counters, that primarily offer pork products. My market only sells cured, smoked, or canned meats. Hunter bacon sort of slid off the shelf into my hands. I love its aggressive name and simple bold packaging. Not afraid to display vacuum sealed bacon and its lovely pools of white lard. 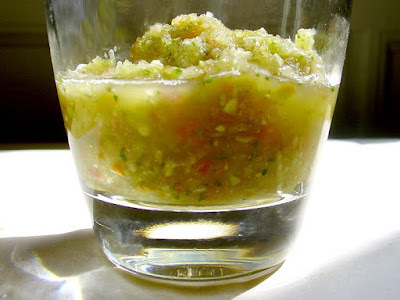 Power packed fresh sofrito with a slushy texture. Its been announced I will be making tacos and other Latin food for my annual dinner party. I'm a little green to the ways of South and Central American food, so this is a real challenge. If I have learned one thing from watching Daisy Martinez, sofrito, sofrito, sofrito. Sofrito is not too different in principal from pesto, except its meant to be cooked with foods, not as a dressing. 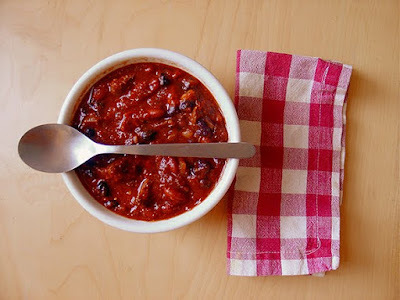 It goes in almost every pot of beans, rice, sauces, braises and more. 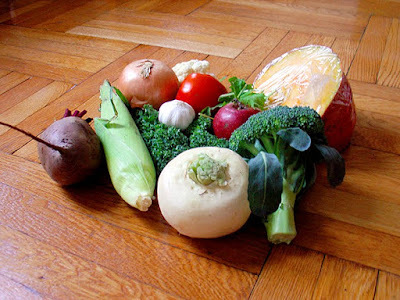 Sofrito is the the base with a distinct fresh and herbal flavor. Culantro leaves are a major flavor component, and I think you will find them in any Latin market. Worth going out of your way for. They offer the same orange/fruity flavor as its coriander seed, but in more delicate perfumed way. There is a special place in hell for people like me. People who mix meat with their desert or specifically bacon in my their candy. 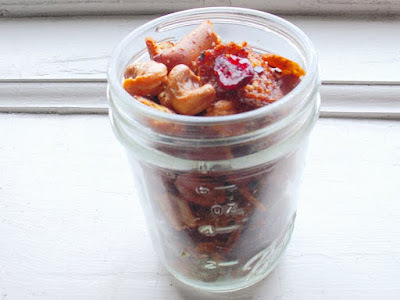 I had favorited a pine nut and bacon brittle recipe. Approx cost to make = $12 for 3 cups. My fellow food loving co-worker pointed out that the redhead in the East Village of New York City serves bacon peanut brittle ($6 and change for 1 bag on site). 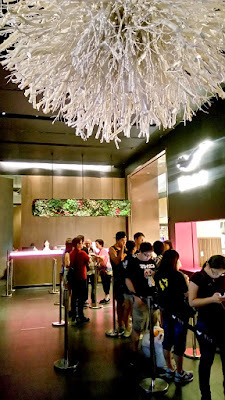 I ventured to buy and try a bag. 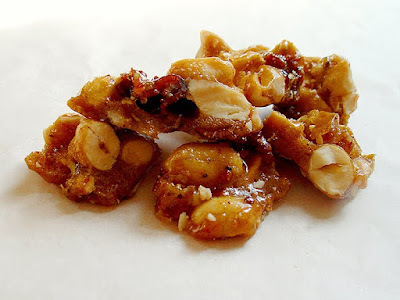 Its not so brittle-ish, but more like candied nuts with a salty smokey flavor. Where is the bacon? I couldn't find any bacon! I vowed never to make an eater ask that question. My recipe is a 4 to 1, peanuts to bacon with a heat from spice to remind you where you may be headed. I wasn't sure what to make of the pale squash in my share this week. It dawned on my its the albino sister of a regular acorn squash. 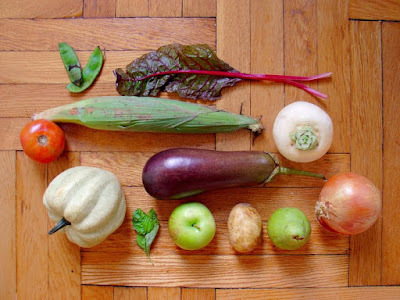 I'm really really excited as the autumn vegetables first enter my kitchen this time of year. I am happy to eat them whole so I can appreciate the flavors, textures and colors. Roasting is the way. Heat oven to 450 degrees. 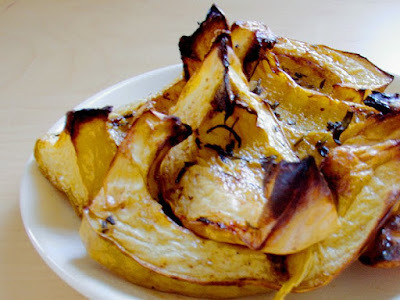 Arrange the squash slices on a cookie sheet, drizzling oil evenly among them. 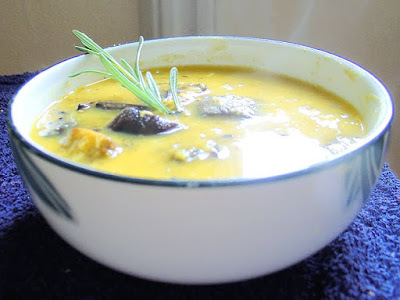 Scatter rosemary and salt over slices and rub so the oil coats the sides and bottoms of the squash. Cook for 20-30 minutes until fork tender. Adult party snack for sharing. If I went back to school this would be the first thing I toted in my brown bag lunch. Its crunchier, spicier, and more adult then your regular chex mix without the tongue numbing sodium of pre-packaged varieties. Whisk egg whites until foamy. 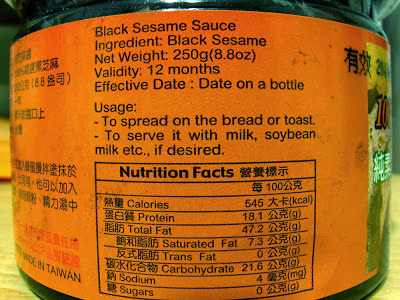 Add the next 8 ingredients and blend. 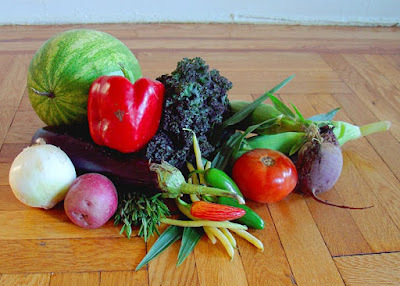 The evening is darker and darker every time I collect my CSA share, and I know that its not long before this honor will end. My work schedule becomes hectic in the fall. I spend all day managing 3-5 clients, tense. Walking to the CSA pickup, waiting for the produce (albeit on the phone with a friendly client) and walking back home down Rugby Rd in fancy Prospect Park South is just the right speed for winding down a day. 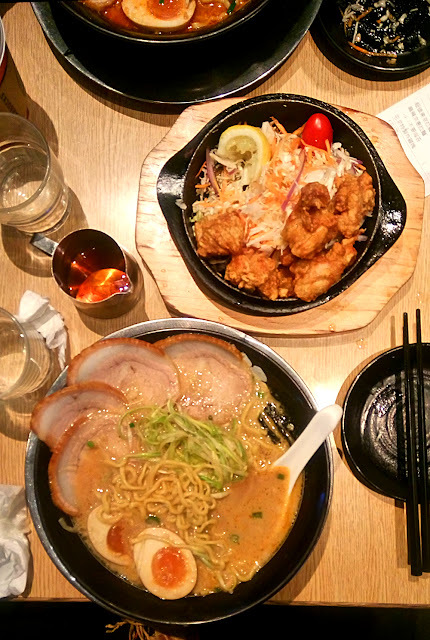 The hardest part, what to eat first! Steaming soup, it must be cool outside. Once upon a time as a waitress at a Lebanese restaurant The Grape Leaf Diner I became quite fond of a hearty red lentil soup. I asked Ata, the cook for instructions. Looking at me like I was slow he informed me to take lentils, water, and onions. Put them in a pot and boil until it was done. Simple. 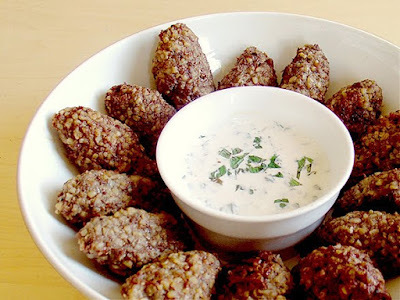 I have since made this recipe hundred upon hundred of times, tweaking and adding to highlight flavors. Its always a cold season favorite and this week it was the platform for finishing up my CSA eggplant, onions, and most potent rosemary. 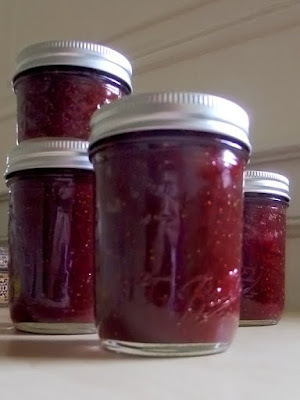 reddish color to the already purple jam. I just wrote about figs! I know! But this amazing thing happened at the grocery store. Pints of black figs were only $1, offering me an opportunity to can a sweeter variation on that fig jam a days back. All in the (large thick stock) pot! Bring to a boil, and reduce to a simmer. Cook until thick, about 30 minutes. Puree in a food processor, food mill, or blender. Bring back to the pot, and boil until the jam stops bubbling, and starts making gloppy gurgle sounds as the air escapes in big bubbles. Whats the real name for this step? About 10-15 minutes. greens of charred and oil packed peppers. Jalapenos grow strong and spicy this summer. Last week Jorge, my farmer, had a big box of peppers (pick a peck anyone?) out for whomever wanted to deal with them. Hand up, I wanted them. Cool September weekends means canning time for me. Heat water, vinegar, salt, and sugar in a large pot until sugar and salt have dissolved. CSA Week 8 brought a gigantic 4-5 lb head of red cabbage. I made some orange and ginger slaw for pan-grilled tofu and avocado sandwiches, some salads, and some I ate plain. When I received an email from fellow Ditams Park CSAer about fermenting sauerkraut at home I was certain I knew what to do with my last 2-3 lbs of cabbage. Sauerkraut is made with a similar process asbrined pickles. 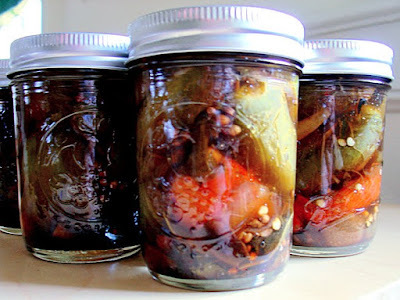 My recipe comes from the same website, Wild Fermentation, as the pickle recipe. 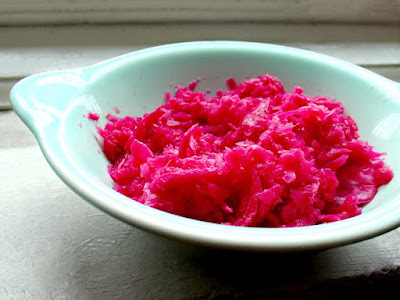 Sauerkraut is among the ranks kimchi, miso, kombucha, horseradish, vinegar, cider, and wines which are left to ferment with the help of microscopic organism that break foods down and develop flavors. These organisms promote diversity among microbial cultures in your body (good for digestion) and can refine flavors unique to your environment. Bonus: some more jalapeno peppers. 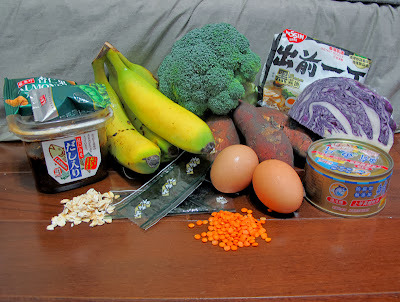 I plan to can this weekend, if I can gather some jars from local places, which sometimes is impossible.